Central Kas One Bedroomed Apartment With Magnificent Sea View. This property enjoys an ideal holiday location in quiet and picturesque Kas, From the balcony there is a marvellous panoramic views of Kas itself and the scenic beaches at Limanagzi and Hidayetin Koyuand. The Greek island of Meis is in the near distance straight ahead over the bay. Access by a stepped footpath right down to the public beach. Kas retains its traditional charm with cobbled streets and wooden balconies. The access to the apartment is by descending 7 gentle external steps (as shown in our photographs) and then ascending 8 steps once inside. The apartment is light and airy with windows and shutters, full air conditioning. Locally managed. We are a couple who enjoy travelling, and have visited many places around the world, mainly through Ben's work but also on holiday. We love to visit our Kas apartment whenever we can, for a bit of relaxation. Ben is a retired engineer and Phyllis a retired librarian. Our permanent home is a converted steading building in rural Aberdeenshire, Scotland, which we have taken many years to create. Our "leisure" time there is mostly spent gardening or decorating. The house and garden will never be completely finished, as there's always something else to do! We enjoy traditional musical events and ceilidhs, and do a bit of hill walking, but we rarely find the time to do as much of these activities as we'd like. Our family are grown up and out in the world. It was love at first sight with the town of Kas, when we visited first in 2008, on holiday from Azerbaijan where we were living at the time. In contrast to busy Baku, Kas was a small piece of Paradise with its pretty harbour, cobbled streets and the smell of jasmine everywhere. It remains unspoilt, making the relative difficulty getting here from the airports totally worth the effort. We bought a smaller apartment first, right in the town centre above a florist's shop, and renovated it completely. We loved it, but gradually came to wish we had our own sea view, and a place to enjoy the evening sundowner without chasing the sun around the bay. We looked around a little and upgraded to the present apartment in 2010. Again, it was love at first sight, and the start of more renovations! You will find it hard to find a better view. The beauty of this property is that it is high enough to give us a wonderful sea and harbour view, but low enough to walk home from town, with no need to have one's own transport. Almost all of Kas is built on a hillside, and most other apartments with a view are just too high up to contemplate the walk home. Besides the great views, another advantage of the apartment being a little above the town is the cooler air, making it very pleasant to sit out. We often relax with a book under the trees by the house, and find this to be a good alternative to the beach. It is a short stroll to the beach, the bars, restaurants, and shops of Kas, or in just a few minutes you can be on the Lycian Way and follow the marked footpath to pretty Limonagzi for a swim and a delicious grilled fish lunch. During the holiday season, boats go to and from the Limanagzi beaches at reasonable cost from Kas harbour. toilet, shower, bidet, Bidet is Turkish style, built into toilet. Water heater. Fully-tiled, newly renovated bathroom with: spacious walk-in shower cabinet (but no bath); handbasin with vanity cabinet below and large mirror above; wc with Turkish style built-in bidet; large electric water heater with Legionnaire's Disease protection; hair-dryer. Towels, bathmats are supplied. Available in both living room and bedroom. The latter has a 'quiet' mode setting. Open plan, it contains: dining table and chairs; coffee table; settee with full size mattress, TV, DVD, music centre with bluetooth capability, split level a/c, fly screens and external shutters. Kitchen well equipped with: full size cooker with four-burner gas hob and electric oven; extractor hood; fridge/freezer; washing machine; dish-washer; dish drainer; electric kettle; toaster; deep fat fryer; water filter jug; pots, utensils and tableware. Wonderful views over Kas Harbour and the surrounding islands. Suitable for both outdoor dining and sunbathing. Electrically operated blind. Notes on accommodation: The main living space has open plan kitchen, dining and lounge area with balcony, a separate bedroom, toilet with shower. The property is located within a small, well-maintained residential building. The apartment has been renovated throughout to a high standard of comfort. The decoration is light and contemporary. It is best suited to a couple or family, as the sleeping facilities in the living room provide little privacy. The floors are of cool marble throughout, except for the bedroom which has a wooden floor. Although both rooms have independent air conditioning units, each has sufficient ventilation and shade from the sun that we find the a/c is rarely required. The bathroom has an external window, a shelved shower cabinet (no tub), and ample storage for toiletries. An electric water heater provides ample, safe hot water on demand. Outside: There is no private garden area, but we are on a quiet road and the area all around the building is planted with trees, shrubs and flowers, providing a nice place to sit out in the sun or shade, and enjoy the sea view below. We supply 2 canvas chairs plus 2 loungers for this purpose. The balcony is also perfect for sunbathing or al fresco dining. We have no pool, but some of the nearby hotels may let you use their private pools and facilities on request. Beautiful clean seas all along this part of the coast provide excellent safe swimming, open to all, and the beach directly below us has a ladder and diving platform for direct access to the sea. Utility Room: Steam iron and ironing board Cleaning / Towels / Linen Towels, including beach towels, and bed linen are supplied and changed after each occupancy; additional cleaning on request with longer occupancies. Other: The sunny balcony gives a great view over the sea, islands, mountains and Kas Harbour; is provided with its own dining table; sofa; parasols; lighting; electrically operated shutters; clothes line, pegs and airer. This was our 4th visit to Kas and each time seems to get better , the apartment was first class , it contained everything that was needed to help enjoy your stay , but best of all was the view from the balcony, it was amazing ! We would have no hesitation in staying here again when next in Kas. The flat was lovely, really well kept and welcoming, the view from the balcony is stunning. Kas is just a lovely place to relax, this was our second time in Kas and we are planning to came back next year to continue our diving training. Definitely on of my husband and I favourite places. We had been to Kas before, but only had a short time there and wanted to go for a longer stay. We looked at several different villas etc before deciding on Phyllis and Bens apartment and we were not disappointed. It was accurately described and very well appointed. The views were worth staying there alone and we had a lovely time watching the boats going in and out of the harbour from the terrace. Mehmet who met us was great and always on hand should we have needed him which was good to know. We ate out most of the time and really enjoyed a meal at the Maya restaurant so much that w found ourselves revisiting. Once again we would like to say a big thank you to Phyllis and Ben for the use of their apartment and to say that hopefully we will be back. We love to hear that our guests have enjoyed their stay, and we are grateful when they take time to tell us. We ourselves enjoy the same things that you obviously did, the balcony and super views over the harbour, and Maya Restaurant is also a favourite with us. Thank you, and yes, we hope you will be back. An excellent one bedroomed apartment with and large balcony that has fabulous views of Kas and the sea. As we were there late in the year darkness fell early and we could have a candlelit evening meal overlooking the lights of Kas. The descriptions and photos os the property are accurate.Will stop here again. Thandks for a very enjoyable week. You are very welcome, and thanks very much to you for taking the trouble to write this review. We are delighted to hear that you enjoyed it so much, and would be very happy to welcome you again in the future. Nice clean apartment good location to Kas town centre. Disappointed to find no welcome pack when we arrived had to go out and find a shop a 11.30pm at night to basics milk water etc. Hi Nicki, thanks for your review, and happy to hear that you liked the apartment. So sorry, and surprised, however to hear you found no welcome pack of basics on your late arrival and had to go out shopping. As you'll no doubt have seen for yourselves, we do leave a note in the food cupboard requesting our guests to replace any such items on a list of basic non perishable food essentials (bottled water, long life milk, tea, coffee, fruit juice, biscuits etc) that they may have used during their stay. We have found that this has worked well in the past, and have always found something there to snack on when we ourselves have arrived late at night. We say we are surprised, because there had only been one set of visitors between own departure late this summer, and your arrival. We ourselves ensured that we left all in order on that front! However, we do thank you for pointing out this failure, and we shall ask our cleaner to include a store cupboard check in future. Mehmet took us to the apartment which was a good distance from the centre of Kas. Not too far to walk but far enough to be quiet and enjoying wonderful views over the town and out to sea. The apartment is a very generous size and proportion. Very nicely decorated and with plenty of handy appliances ( washing machine & dishwasher ) The air conditioning was also very welcome on a few occasions. The little touches which Phyllis and Ben have left, such as sun hats, snorkels and English novels all make the stay extremely comfortable. We would absolutely recommend Kas and this truly brilliant apartment. Thank you Chris and Emma. We are always happy to hear that our apartment has pleased our guests, and that they have enjoyed their stay as much as you have. We hope you might come back one day. There are 7 easy steps down to building's front door and once inside there are a further 8 steps up to get to our apartments front door. Nearest airports are Dalaman (approximately 150 Km, and a 2 hours transfer time) or Antalya (200 Km, three hours transfer). Various Turkish domestic airlines provide frequent flight connections from Istanbul to both airports. Once in Kas you don't need a car as everything is accessible on foot, or by taxi; bus or dolmus transport is readily available for places further afield. The bus station is 10 minutes' walk away. Kas, although small, is the local market town as well as a tourist destination, and you'll have no difficulty in finding banking and postal facilities, medical and dental practices, pharmacies, supermarkets and hardware stores, should you need them. Numerous tours, jeep safaris and boat trips are commercially available on a daily basis to surrounding places of interest, such as the Saklikent Gorge, the sunken city of Kekova, or the Greek Island of Meis (or Kastellorlzo). Most tours include swimming stops and lunch. Car and scooter hire, and boat charters, are also available. For the adventurous, there are paragliding, scuba diving (PADDI courses available), mountain biking, sea kayaking, canyoning, or hiking the `Lycian Way'. The whole area is rich in sites of historic interest such as well preserved Lycian rock tombs and sarcophagi; Roman and Greek remains (temple and amphitheatre), many of which are to be found in the town itself. Kas is a shoppers' paradise full of boutiques selling original clothes, handicrafts, local silver and gold jewellery, and designer leather goods. Upmarket galleries and antique shops sell high quality original Turkish artwork, hand made kilims and carpets. At the Friday farmers' market you can buy fresh produce such as olive oil and local cheeses. Restaurants and bars are too numerous and varied to mention individually and we all find our own favourites. 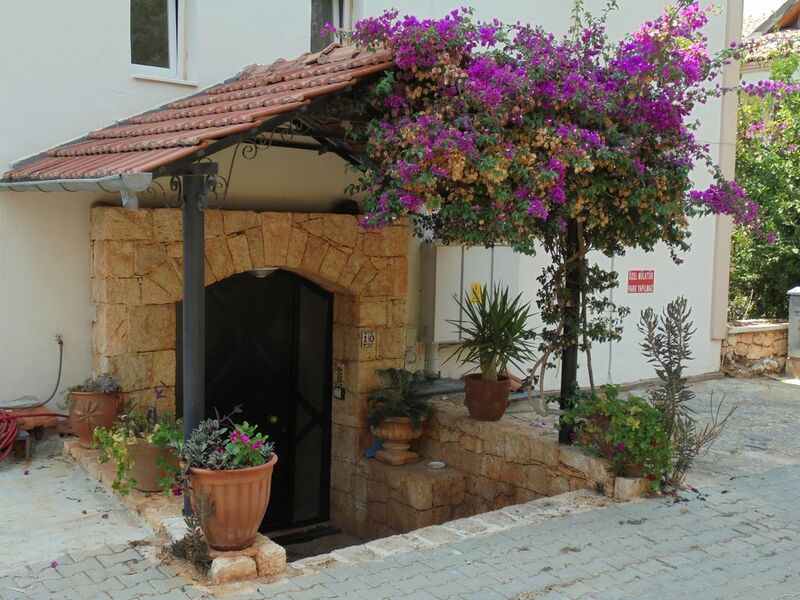 Many are located in beautiful secluded gardens or in lively harbour-side settings; most offer typical Turkish food and local wines; some offer live music and dancing under the stars; all are friendly and welcoming. We leave local guide books in the apartment (not to be removed, please), and there's a Tourist Information office on the main square. Most people in Kas will speak to you in English should your command of Turkish leave something to be desired, and you will find that our agent, Mehmet, is friendly and willing to help if required. Booking Notes: Your deposit will secure a booking. Balance is due 4 weeks prior to occupation. We ask for payment to be made in full for late bookings. Changeover Day: Flexible if prior bookings permit Notes on prices: Prices quoted exclude electricity, water, internet, normal cleaning and laundry services.